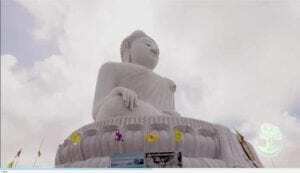 Wat Chalong in Chalong is just 35 km (or 56 minutes) away from Bismarcks Paradise Phuket luxury villas resort. Wat Chalong, or Wat Chaiyathararam (or Wat Chaithararam) as it is know by the locals, was built at the beginning of the 19th century on the island of Phuket. If you are in Phuket and you only have time to visit one temple only … then the temple complex of Wat Chalong between Central shopping complex and the Chalong district should be the one. 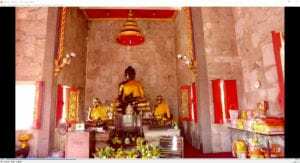 It is the Wat which is dedicated to Luang Pho Chaem and Luang Pho Chuang. Not only because these two monks played a pivotal role in leading the local Chalong community in the Chinese rebellion in 1876, but also because with their deep and profound knowledge of herbal medicine they were able to help the injured. Of spiritual significance is the newest temple in the compound, the Wat Chalong Chedi, built behind the main temple. A chedi is an hemispherical structure containing relics, also known as a stupa in other parts of Asia like India and Tibet. Also a splinter of a bone from Buddha is displayed behind a glass enclosure which is of special significance for Buddhists here. In addition, the occasional noise of Chinese firecrackers can pierce through the quiet atmosphere so don’t be alarmed because it is a normal occurrence. From its third floor, you have a wonderful view of the Wat Chalong area and you can spot the Big Buddha in the distance. Like wise you have an excellent view of the Wat Chalong compound when you visit The Big Buddha. This all changes when the Fun fair is underway because it turns into a busy, noisy buzzing area with food stalls, local entertainment and many local goods for sale. Wat Chalong, or Wat Chaiyathararam (or Wat Chaithararam) is, coming from Central Festival shopping mall, a few kilometres south on the left side of the road and is on the same road which leads to Chalong and Big Buddha.